africa, african, safari, safair, jungle, cardboard, cutout, standup, prop - Dino Rentos Studios, INC. 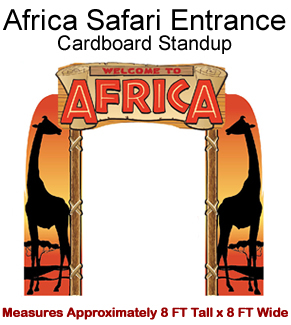 This Africa Safari Entrance Cardboard Cutout Standup Prop is the perfect addition to any Safari or Jungle Themed event or party. School dance? Company event? Breathe life into your next function with this cardboard standup entrance that's sure to generate smiles and get looks from everyone! Assembles in 30 minutes. Comes with all the predesign componets to assemble at your event. Upgrade to double-walled cardboard for extra strength. Choose High Gloss or Matte Finish. Takes 5 Days to Manufacture. Expedite Service Available. NOT 3D. This is a flat facade. Printed only on front.